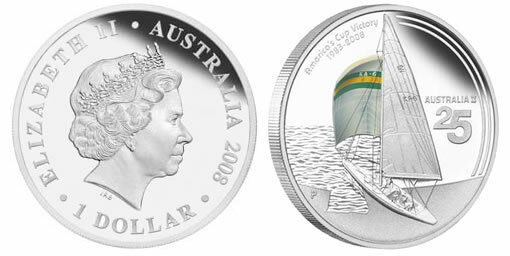 The Perth Mint struck and launched a silver proof commemorative coin celebrating the 25th anniversary of Australia II, which became the first challenger ever to win the America’s Cup on 26 September 1983. The Australian legal tender coin is made of 99.9% pure silver, contains one full ounce, and has a very limited mintage ceiling of 5,000. The very attractive coin comes with a unique piece of history — a fragment of sailcloth taken from Australia II’s genoa, and worn as she crossed the finish line at the end of the decisive seventh race. Speaking in front of Australia II at the Western Australian Maritime Museum, John Longley AM said, "Although the victory was won 25 years ago, it still seems like yesterday to me and the crew. So, for The Perth Mint to honour our efforts with the release of this magnificent coin, so long after the event, it is quite humbling." The coin’s reverse depicts the 12-metre yacht with a coloured representation of her spinnaker bearing the famous identification number KA-6. The coin is accompanied by an exclusive memento of the 1983 America’s Cup – a piece of sailcloth taken from the clew of Australia II’s 4-1 genoa. The sail was used throughout the series, including the final beat to windward of Race 7 when she held off US yacht Liberty in a 49 tack duel. 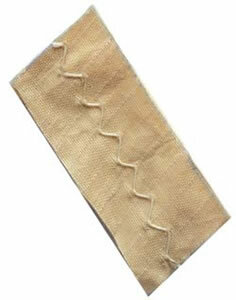 It was the head sail worn by Australia II as she crossed the finishing line on 26 September. The sail is made from a bonded material with woven Kevlar cloth bonded to a Mylar film. The number 4-1 signifies that it is the fourth code 1 sail made for the 1983 campaign. Code 1 sails are the lightest sails, used in conditions from 1 knot to a maximum of 10 knots of true wind speed. The sail had been in the possession of Australia II crewman John Longley since being retrieved from a fire that destroyed most of the sails from Australia II and Australia III in 1986.